If you’re joining us for a stay here at Rams Horn, you’re sure to spend some time in Estes Park. And if it’s your first time to the park, you may be overwhelmed with options, not to mention the glorious surroundings here in Estes Valley — visitors often don’t know where to start! After all, there’s so much to explore in our mountain village. So, we’ve compiled a list of resources that’ll help you to start out on the right track. Take a look at the sites below, and if you have any questions about our unique town, don’t hesitate to get in touch with us. Estes Park is home to world-renowned cuisine. From steakhouses to pubs and grills to pizzerias, you’re sure to find the perfect plate to suit your palette. Take a look at Estes Park’s best restaurants on the Visit Estes website. You’ll find a list of local favorites that are sure to please any taste. There’s so much to do around town. View wildlife or stroll through downtown and shop. Take a scenic drive, or visit local museums. Get pampered with a day at the spa, or soak in the arts. Taste local microbrews, or try a round of golf. Take a horse tour, or jump on a bike. Here in Estes, the options are endless. Estes Park is a diverse playground in the midst of the colossal Rocky Mountains. Explore all of the options that Estes has to offer on Visit Estes’ Things to Do page. 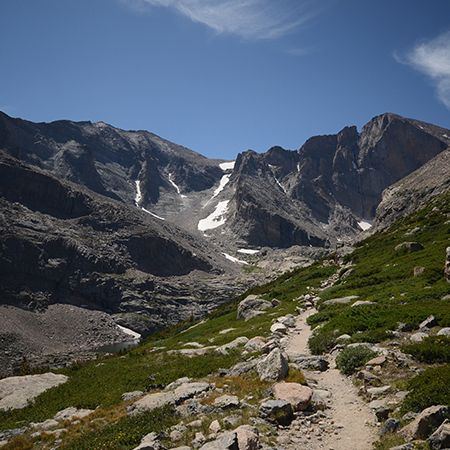 Landscape of Longs Peak, Rocky Mountain National Park, Colorado. Estes Park offers activities year-round. Take a look at the best that Estes has to offer on Visit Estes’ Events page. Find out which bands are playing next. Learn about art, history, and nature exhibits. Attend seasonal events, and make the most of your time spent here in Estes. Estes Park has been home to tourists for a century. So if you’re new to the area, don’t fret. Visit Estes’ website has the maps and information that you’ll need to navigate to the greatest spots in town. View town maps, including street maps, trail maps, parking maps, shuttle maps, and more. You can also learn a bit about the history of our high-valley town on the Estes Park Information page. Estes-Park.com: Learn more about our city straight from the source. Take a look at recent news and events. Find out about fun things to do up here at altitude, including places to explore. Estes-Park.com provides visitors with information about dining, shopping, hiking, trips to Rocky Mountain National Park, local museums and galleries, upcoming concerts, and a variety of other attractions. Colorado.com: Explore Estes’ activities, art, and attractions via our state website. Colorado.com offers up even more information about dining experiences, the history of our town, local museums, and upcoming events. Estes Park Webcams: View up to date webcams around our town. If you’re especially curious about weather, traffic conditions, and other happenings around town, you can view a variety of live webcams on the Estes Park Webcams site. If you’re planning on visiting our cozy yet contemporary town, have a stay here at Rams Horn Village Resort. We have a variety of cabins that are just minutes away from downtown Estes Park. Plus, our luxurious cabins are just a hop and a skip from Rocky Mountain National Park. Schedule your stay today — check cabin availability right here online.